Medical Skin Needling, also referred to as Collagen Induction Therapy (CIT) and Micro-Needling is aimed at stimulating the body’s own collagen production to reduce the appearance of fine lines and wrinkles, stretch marks, skin laxity and scarring such as that caused by acne or chicken pox. It has also been successfully applied to the indication of hair restoration in cases of alopecia. There are a number of different devices, such as manual dermarollers or automated pen-like devices now available to the UK marketplace. The treatment introduces a series of fine, sharp needles into the skin. The needles are attached to a single use, sterile roller which is moved over the surface of the skin to create many microscopic channels or to a cartridge of needles arranged in a circle at the end of an automated device . This damage encourages the body to produce new collagen and elastin which generate new skin cells to repair itself; the skin becomes thicker, plumper and more youthful. Private costs for medical skin needling treatments depend on the area(s) being treated and the type of device being used. The Collagen P.I.N. 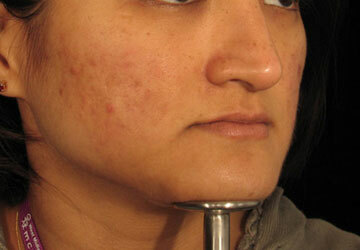 (Percutaneous Induction Needling) device is an automated micro-needling device. It is designed to treat a wide variety of issues, including fine lines and wrinkles, skin ageing, pigmentation, uneven skin tone, acne scars, and stretch marks. The eDermastamp™ or eDS™ Skin Rejuvenation is used for a treatment referred to as medical skin needling, collagen induction therapy, percutaneous collagen induction, micro-needling or simply electronic dermarollering. The Roll-CIT™ from Environ® marketed for the treatment of Medical Skin Needling is the patent pending creation of Dr Des Fernandes, a South African Plastic Surgeon. SkinPen® is a clinically-proven, medical micro-needling device, made by the American company Bellus Medical, that can help improve the appearance of facial acne scars, reduce the signs of ageing and improve skin health through collagen induction therapy. The clinical concept of using surgical needles in minimally invasive skin rejuvenation and repair procedures started to develop as a recognised technique during the mid 1990s. In 1995, Orentreich et al published a procedure for treating depressed subcutaneous scars and wrinkles, now known as subcision from the phrase “subcutaneous incisionless surgery”, where a tri-bevelled hypodermic needle was inserted through a puncture in the skin surface, adjacent to the scar, and its sharp edges were manoeuvred under the defect. The procedure attempts to raise the base of the defect to the level of the surrounding skin surface by surgically releasing the skin from its attachment to deeper tissues, which results in skin elevation, and by the introduction of a controlled trauma which initiates wound healing with the consequent formation of connective tissue that raises the depressed scar. 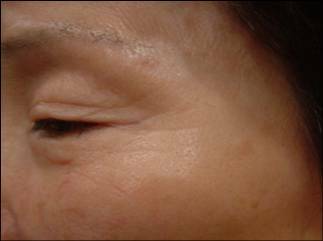 Shortly after, Camirand et al published their use of a commercial tattoo machine, without the tattoo ink, to produce multiple punctures in achromic (having no pigment) and hypertrophic (red and raised) scars and found significant improvement in the appearance of the scars and in some cases were able to obtain re-pigmentation of the area. Dr Des Fernandes then delivered a paper in 1996 on upper lip line treatment using a “needle stamp” for percutaneous collagen induction (see image to right). Following on from this early work the development of skin-needling devices and procedures have somewhat taken their time, particularly as laser and radio frequency treatments have shown such rapid growth. However it is felt that the significant benefits that medical skin needling can provide are now coming to the fore and beginning to establish themselves as key treatment options available to medical physicians and aesthetic practitioners. If you are considering medical skin needling the following information will give you a basic understanding of the procedure. It can't answer all your questions, since a lot depends on the individual patient and the practitioner. Please ask a practitioner about anything you don't understand. Medical Skin Needling, also referred to as Collagen Induction Therapy (CIT) and Micro-Needling, is considered to be a relatively new concept within the plethora of aesthetic treatment options available for skin rejuvenation, having come about in the format that we now see since 2005. Like many of the other treatments available it is aimed at stimulating the body’s own collagen production to reduce the appearance of fine lines and wrinkles, stretch marks, skin laxity and scarring such as that caused by acne or chicken pox. It has also been successfully applied to the indication of hair restoration in cases of alopecia. This is achieved by introducing a series of fine, sharp needles into the skin following the administration of a topical local anaesthetic, in the case of medical grade devices, to reduce discomfort. The needles are attached to a single use, sterile roller or to a needle plate at the end of an automated pen-like device which is moved over the surface of the skin to create many microscopic channels or columns, approximately 0.07- 0.25mm wide, at various depths of penetration. In the case of medical rollers this is within the papillary dermal layer of the skin where collagen and elastin fibers are located (see illustration). Cosmetic rollers however reach a much shallower level in the epidermis where they aid absorption of topical ingredients. These minute punctures close over almost immediately as the channels created are very small. This “damage” to the dermis encourages the body to produce more new collagen and elastin which generate new skin cells to literally “repair” itself, thus the skin becomes thicker, plumper and more youthful. Although primarily used on the face, this procedure can be carried out anywhere on the body, such as on stretch marks on the thighs and abdomen, and generally on all skin types. There are a number of different roller devices, such as Genuine Dermaroller™, Roll-CIT™ and MTS-Roller™ now available to the UK marketplace aimed at medical skin needling. These vary in needle length, from approximately 0.02mm, designed for personal, cosmetic use at home, often in conjunction with a skin care regime, as the minute skin punctures assist the absorption of any active ingredients which improve and maintain the appearance of the skin. Needle length on some devices can reach up to 3mm, designed for professional, medical use which will achieve a more significant result on skin regeneration when used by a trained practitioner to induce new collagen formation. Often, the at-home roller will be recommended for use for several months during and following conclusion of a treatment programme with the professional roller, in conjunction with an appropriate skincare regime to both promote and maintain rejuvenation results. Use of the so called cosmetic rollers is deemed safe to carry out at home due to the minimal level of needle insertion and is considered to be virtually painless by most people. As this treatment has evolved, automated systems have been developed. Of course they are not automated rollers, but in fact automated needle bearing stamps fixed to a hand-held or pen-like unit which is operated in a continuous motion across the skin. They have been designed to improve the ease-of-use, speed and flexibility of medical needling treatments, and to augment the achievable treatment results whilst reducing pain and discomfort. Devices being used include Dermapen and eDermastamp. What happens during a Medical Skin Needling treatment? Skin preparation with the application of vitamin A and C creams may be recommended for up to 4 weeks prior to the commencement of the procedure. A similar skin care regime will also be recommended for up to 6 months post-treatment to aid the healthy production of the new collagen and the rejuvenation of the skin. Treatment sessions with medical grade, manual rollers take between 10 minutes and an hour depending on the size of the area being treated. Pain should be minimal due to the application of the topical anaesthetic; however you may still feel some discomfort. In most cases you will be given a cosmetic version of the treatment roller to use at home for the next three months in conjunction with the topical skincare regime to enhance the final results. It can take between 4 – 8 weeks before visible signs of skin regeneration are seen and the process will continue over the following months, providing a gradual enhancement. A single treatment can produce noticeable results, however a programme of 2 – 5 treatments spaced 2 – 3 months apart is often recommended to achieve optimum results, in conjunction with an at-home regime. The specific number of sessions required will depend on the area being treated and the severity of the indication, as well as the level of natural response from the individual’s body. 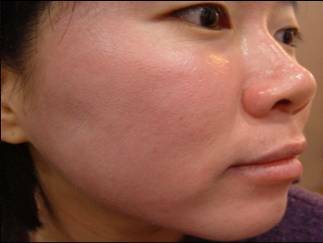 How long will it take to recover from Medical Skin Needling? Recovery may take 24 hours or up to a few days; most people should however be able to return to work the following day. Recovery time depends on the aggressiveness of the treatment, i.e. the length of needles used. Depending on the area of your face or body being treated and the type of device used, (i.e. needle length) the procedure is said to be well tolerated and in some cases virtually painless; feeling like a mild prickling sensation. However, in the case of medical grade rollers your practitioner will apply a topical anaesthetic to your skin prior to treatment to reduce any pain and discomfort. The skin will be pink or red in appearance for a couple of hours following medical skin needling treatment, much like a sunburn, with some minor bleeding and bruising possible, depending on the aggressiveness of the procedure, i.e. the length of needle used for the particular indication being treated and the number of times it is rolled across the treatment area. The skin may also feel warm, tight and itchy for a short while. This should normally resolve in 12 - 48 hours. Special camouflage foundation called Lycogel can be worn which promotes the healing of damaged skin post treatment. What should you do after a Medical Skin Needling treatment? It is very important that you follow the advice of your practitioner carefully after any treatment to help make the procedure as successful as possible and to reduce the risk of complications. applying a broad spectrum sunscreen product with a high SPF immediately after treatment before leaving the clinic and when going outside following treatment. 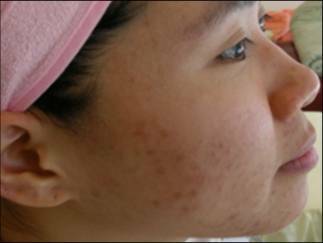 Who should not have a Medical Skin Needling treatment? Have used Roaccutane (isotretinoin) within the last 3 months. Have open wounds, cuts or abrasions to the skin. Have a current outbreak of herpes simplex (cold sores) or any other infection or chronic skin condition in the area to be treated. 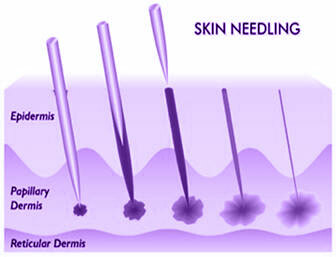 Who can perform Medical Skin Needling? Only suitably trained medical professionals and beauty therapists should perform medical skin needling procedures. This is particularly relevant given the differing needle lengths used within this procedure. Professional, medical grade rollers or automated devices should only be used by qualified doctors, surgeons and nurses. What is the average cost of Medical Skin Needling? Private costs for medical skin needling treatments depend on the area(s) being treated and the type of device being used. Generally prices for treatment with manual rollers is comparative to treatments with automated devices. For example, a programme of in-clinic treatments with either the Medical or the Cosmetic Roll-CIT™ starts from around £395.00. A single, in-clinic treatment with the Genuine Dermaroller™ is likely to cost from £200 - £350, depending on the practitioner, including post treatment skincare. Further sessions, should they be required will be less and are often combined at a discount in a programme. Cosmetic, home use rollers are available from £60 - £75, and up to £115+ when combined with skincare products in a kit. Medical Skin Needling for Collagen Induction Therapy is considered to be another useful and successful tool in the armament of the cosmetic practitioner in the fight again the signs of ageing. Used in combination with tried and tested professional skincare products it can have a significant effect on the appearance of the skin with minimal downtime and discomfort. Treatment with medical derma rollers is not governed by the regulations of the Care Quality Commission, meaning that clinics are not required to be registered and inspected by them if they offer this treatment. Consumers must therefore be sure to seek out practitioners who can demonstrate proper training credentials and experience for such treatments. Many copycat devices are also available for sale on Internet sites, mostly auction sites such as eBay or less reputable online pharmacy sites from abroad. Often these include the sale of medical grade rollers which should not be used by the home user due to the potential for harm and the risk of infection if the proper aseptic precautions are not followed. We would recommend that consumers visit a clinic for more aggressive medical skin needling treatments and for appropriate home care programmes, however if you would like to try this treatment at home to assist with the absorption of skincare products we would urge consumers to purchase the devices through reputable online sellers, clinics or direct from manufacturers or distributors. Images above provided courtesy of Aestheticare Ltd. 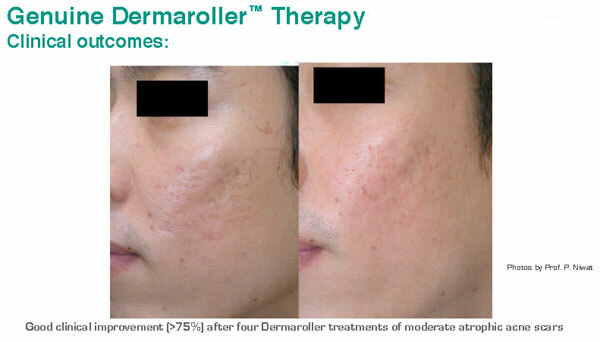 Above pictures show significant improvement in acne scarring following a series of treatments with Collagen Induction Therapy using Dermaroller™ medical needling. Images above provided courtesy of MediZen Ltd. 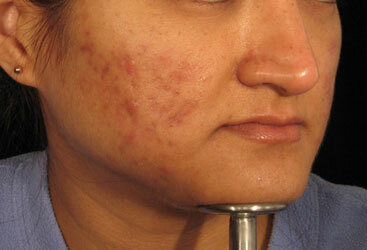 Improvement in acne, before and after treatment with MTS-Roller . 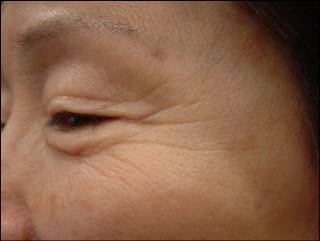 Improvement in crow's feet wrinkles, before and after treatment with MTS-Roller . Click for ALL Medical Skin Needling clinics in the UK & Ireland registered and verified by Consulting Room. Male-pattern baldness is the most common type of baldness. Study shows that microneedling with Minoxidil is an effective treatment for male-pattern baldness.